Just How Good is the PSLF Gamble? What do professional blackjack players and not for profit or government employed student loan borrowers have in common? They both have a great chance of making a TON of money if they stick to the plan and don’t screw anything up. Have you heard of the term expected value? If not, it’s going to blow your mind away and make you see the Public Service Loan Forgiveness program (PSLF) in an entirely new light. 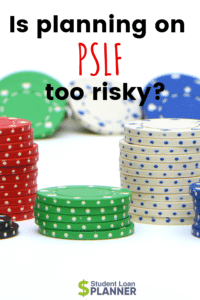 What are the Odds PSLF Gets Repealed? Right now, I’d say PSLF perhaps has a 90% chance of working out exactly as we think it will. I usually am more cautious and say 80%, but the new GOP reform bill has me feeling confident that the Republicans will not move to affect current borrowers. The party does not want to go after promissory notes already signed with PSLF in the details. Even though saying 90% would make my argument look more compelling mathematically, let’s assume we know nothing about whether PSLF is actually going to happen. In that case, we’ll say the odds are 50/50 of receiving it. If you have built up at least a couple years of credit on the PSLF program, then you stand to receive thousands in loan forgiveness. Recall that no matter how high your income, the payments cap out at the Standard 10 Year monthly payment plan. Assume you owe $200,000 at 7% and earn $100,000 a year. You get married to someone in 2018 making $400,000 a year with no debt. You’ve already accumulated 5 years of credit towards the program. How much forgiveness could you be in line to receive? The difference in the numbers above is STAGGERING. You’d pay about $118,000 less over 5 years in this example. You’d also receive about $168,000 in loan forgiveness. Remember that with capped payments, you can stay on a gradual loan repayment path. That still leaves you with a very large balance leftover for Uncle Sam to forgive. The forgiveness numbers above would have been even larger for a single earner with no spousal income or for a couple who both had qualifying loans to be forgiven. What’s the Downside of Going for PSLF then Having to Abandon It? Continuing the above example, let’s assume that refinancing the $200,000 at a 3% over 5 years is the cheapest option (pretend PSLF doesn’t exist for a moment). The worst-case scenario would be if a borrower used 10 years to pay back her loans at the high government provided interest rate. We can see this modeled below. The difference in the interest cost between the two options is a little over $68,000. That dollar figure is smaller in purchasing power. After all, we are comparing a 10-year repayment period to a 5-year repayment period. Even so, we know that the largest “risk” of not refinancing is paying tens of thousands back on an inefficient plan. Notice that risk is in the five figures, not six. 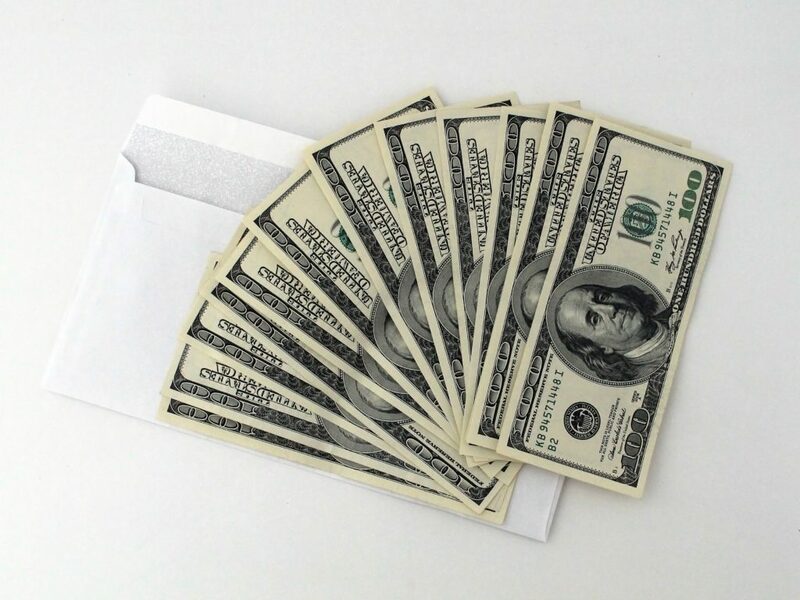 What is Expected Value and Why Does it Matter? Time to get a little nerdy. I was a Statistics major in college, and one of the core concepts I learned was Expected Value. To figure out the expected outcome of an event, you need to multiply the values by the probabilities of each outcome and add them. To use a simple example, let’s say if you flip a quarter and get heads, you win $1. If it lands on tails, you lose a dollar. The Expected Value (EV) of flipping a quarter is then EV=0.5*($1) + 0.5(-$1) = 0. The “value” of this bet is dead even. You should be willing to pay $0 to take this bet. What about a little more complicated example using that same quarter? Let’s say you flip the quarter two times for the new game. If it lands on tails both times, you lose $10. If it lands on tails once, you lose $5. If it lands on heads both times, you win $30. What’s the fair price of this bet? You need to use Expected Value to find out. You would have to pay $2.50 to take this gamble just for it to be a fair wager for both parties. Let’s use that card counting example in the game of blackjack from the beginning of the article. I don’t play the game, but basically, the goal is to get close to a score of 21 with cards. Statisticians figured out that if you have an insane memory and can remember what cards have already come out of the deck, you’ll have a better idea of what remains. Why is that important? Because the probabilities of you pulling the card you need to win are stacked in your favor. Think about the quarter flipping example. We found that the “flip it twice” bet was worth $2.50. What if someone let you make that bet for $2? Logically, you should want to take that bet all day long. You’re literally paying $2 for something that’s worth $2.50. In the same way, professional gamblers might be able to do things that shift the probabilities of a gamble in their favor. That means the price of the bet would be wrong. That allows them to profit. Let’s use the earlier example of the $200,000 borrower. We found that if PSLF works out the way we’d expect, she would receive about $168,000 in loan forgiveness. If the program gets repealed, she would lose about $68,000 to interest. EV= 0.5*($168,000) + 0.5*(-$68,000) = $50,000. Since you get to take the PSLF gamble for free, the value of taking this bet is worth $50,000 to the borrower. What If We Apply More Realistic Probabilities to the PSLF Program? I seriously doubt the odds of PSLF repeal are 50/50. The Republicans are the most likely political party who would want to defund the program. However, this very party just released their plan to completely reform the national student loan system but leave PSLF for current borrowers intact. The GOP has not suggested limiting the value of PSLF for folks who are currently working towards it even once. In my view, they do not want to offend highly educated high-income constituents. Almost no one would vote for them if they repealed PSLF. There are hundreds of thousands who would vote against them if they did repeal it. We’ve only seen one serious attempt at PSLF reform from the Democratic Party, and it came from President Obama. His administration sought to limit PSLF to no more than $57,500, which would be a serious blow to highly indebted borrowers. Democrats in Congress shot down the proposal in his budget, and that was the end of the discussion. Hence, if we look at the likelihood that something like PSLF occurs in its present form, I’d expect at least a 4 in 5 chance that it happens. Hence, let’s update the Expected Value in our example with the new probabilities. EV= 0.8*($168,000) + 0.2*(-$68,000) = $120,800. We would expect to pay $120,800 for such a bet. Of course, going for PSLF does not really cost anything. The only “cost” if you could call it that is the higher interest you’d pay if the forgiveness never happens. If a casino ever offered this kind of a bet to its customers for free, it might go out of business in 24 hours. With such amazing payouts, I don’t understand why anyone would decide to give up on PSLF and refinance instead as long as they are at a qualifying job and plan to stay there. 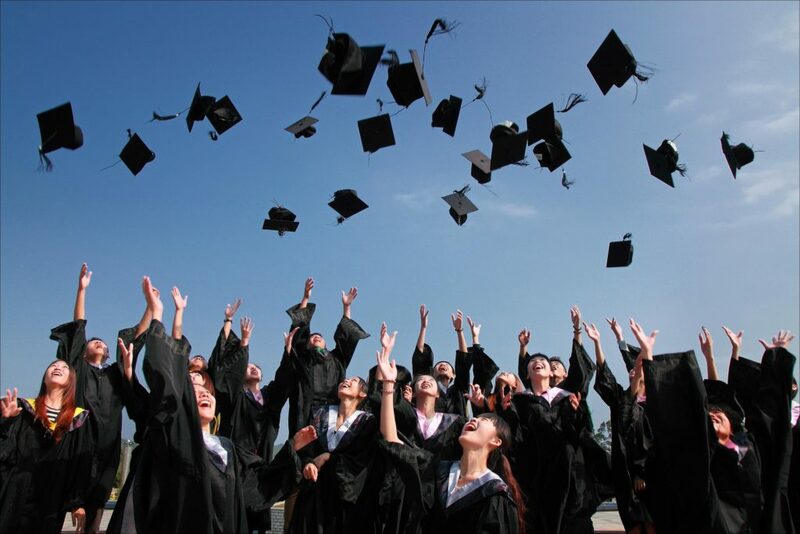 If you change your mind on your career goals, then leaving PSLF could be a smart choice. One example I see is a physician who wants to go part-time or stay at home to spend more hours with their children. Another situation would be a lawyer who wants to quit their job in a couple years to work for herself. It’s clear though when you apply this statistical lens to the PSLF debate that’s getting waged inside you that this is an amazing deal if you just look at the numbers. Perhaps it’s even a once in a lifetime kind of giveaway as the loophole gets shut down for future borrowers as of July 2019. Run the numbers and make sure you’re making the right decision on PSLF according to how much risk you like taking. You don’t have to be very aggressive to love the odds on this bet though. If you’ve got a ton of debt and aren’t confident in what to do, I can solve that uncertainty for you with my flat fee student loan plan service. Of course, please feel free to reach out to me directly at help@studentloanplanner.com or by using the contact form on the site. A goal without a plan is a wish. Don’t wish for student loan forgiveness. Plan for it. Only if they’re Direct loans. You can find this out by logging into https://nslds.ed.gov/npas/index.htm and seeing what the titles say in your loan summary. If they say FFEL, then you should probably just refinance or pay them off.